James Baker says if Shamir had not been pushed to attend Madrid conference, "you wouldn’t have had Oslo." Yitzchak Shamir, who passed away Saturday, called Binyamin Netanyahu "squishy" and "too soft," according to James Baker, who was Secretary of State under George H. W. Bush. Shamir himself was "really hard-line," in Baker's view. 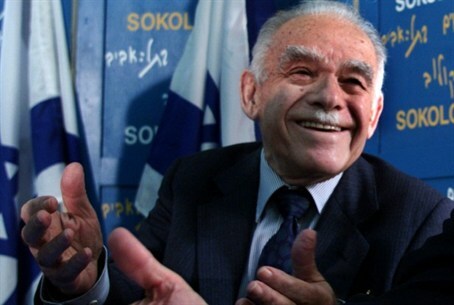 However, the diplomat said, Shamir's relationship with President George H. W. Bush got off to a bad start when Bush felt Shamir had misled him regarding settlement in Judea and Samaria (Yehuda and Shomron). An interview with Baker last year gives fascinating insights into the dynamics that led to the Madrid Conference in 1991 and the Oslo Accords in 1993. Baker was interviewed by researchers from the University of Virginia's George H. W. Bush Oral History project. Baker recounted the Bush Administration's political struggle against Israel and AIPAC [America Israel Public Affairs Committee] regarding a $10 million loan guarantee Israel had asked for, which the U.S. made conditional on its not being used for settling Jews in Judea and Samaria. "The only time AIPAC has ever been beaten was in 1981, on AWACS [Airborne Early Warning and Control Systems sold to Saudi Arabia - ed. ], and in 1991 on the loan guarantee," Baker said proudly. "And that’s tough stuff." "President Bush got off to an unfortunate start with Yitzchak Shamir, the Prime Minister of Israel," Baker explained. "Yitzchak Shamir, in one of his first meetings with President Bush said, 'Don’t worry about the settlements. We’re going to take care of that; we’ll deal with that.' President Bush interpreted that to mean, 'We’re going to slow it down, we’re going to stop it, we’re going to deal with your problems.' Every administration, Democrat or Republican, had been opposed to settlements. And then when that didn’t happen, there was sort of a sense of betrayal I think on President Bush’s part." The loan guarantee request came up just as the U.S. was assembling a coalition to eject Iraq from Kuwait, Baker recalled. "One of the major things we did was to keep Israel from being involved in that war, but I give credit to Yitzchak Shamir. He was really hard-line. Did you know that after [Benjamin] Netanyahu became Prime Minister the first time Shamir called him squishy, too soft, he’d given away too much? So that’s how hard-line he was." Shamir was presumably referring to Netanyahu's agreeing, in the 1998 Wye Accords, to give up Jewish control over most of Hevron. "But I’ll tell you," Baker went on, "when the war broke out and Israel was hit by the Scuds, they wanted to intervene, particularly Moshe Arens, the Defense Minister, and others. We got on the horn to them and at that time the President’s relationship with Shamir was quite strained. He asked me to call him and I called the Prime Minister. I said, 'We sure hope you’re not going to—this would really turn this from an international community against Saddam Hussein to an Arab-Israeli dispute, and it really would be counterproductive.' To his everlasting credit, Shamir overruled his Minister and said, 'We’re going to let the Americans take care of this.' And we agreed to do some more sorties on the Scud sites in Western Iraq and so forth." In his conversation with the University of Virginia scholars, Baker recalls the difficult fight the Administration waged against Israel in Congress regarding the loan guarantees – a fight Israel lost. In Baker's view, this loss led to crucial diplomatic developments. "So yes, that was tough, the loan guarantee," Baker said. "But I’ll tell you one thing the loan guarantee fight did. In my view it probably made Madrid possible. Madrid was important, not just because it broke a taboo. If you remember back in those days, the Arabs wouldn’t talk to Israel, they wouldn’t even sit down with them, and that was 25 years or so of policy. The loan guarantee fight was really a fight about settlements." "[W]e made a lot of progress to get them talking to each other after 25 years," he added. "I’m going to claim—I hope this is correct, I believe it is—that it led to the Israel-Jordan peace agreement. You see, it led directly to Oslo. The United States wasn’t involved in Oslo. The parties did that off to the side and it was dramatic. But had you not had Madrid, you wouldn’t have had Oslo. You wouldn’t have had Oslo in ’93."